When asked to write a book review for this new cookbook, Instant Indian: Classic Foods from Every Region of India Made Easy in the Instant Pot®, I jumped at the chance. There are three reasons: first, because I am a vegetarian. Second, because I happen to love Indian food. And third because I have an Instant Pot® sitting in my kitchen that needs to be used and this would be the perfect reason to use it! I thought, this is going to be a great book and I am going to love testing out recipes for it!!! I decided to test out two recipes, because I live alone right now and it's hard to cook up that much food unless I have a guest over. As it turns out, I am dating a gentleman from India right now and I actually have an excuse to test out these dishes and see if they come close to the real thing. The Instant Pot® is a multi-use programmable pressure cooker that became very popular last holiday season. Since then there have been many cookbooks that have come out to show the many things you can cook in it. It is quite versatile and is useful for appetizers, meals and even desserts. The nice thing about Indian food is that there are so many different spices and tastes that if you get your kids interested in it when they are little they will grow up liking it and be used to it. I did that with my kids and all kinds of food and now they have adventurous palates. Don't just feed them chicken nuggets and hot dogs. Kids need to learn to eat real food with different textures and tastes. I decided to try out a recipe called Jeera Pulao, which is Cumin-Scented Brown Rice with Green Peas. It happens to be something I like a lot and is easy to make and makes a great side dish for any main entree. The author notes that one of the many delights with the Instant Pot® is how well it cooks brown rice and other complex grains. This cumin-scented rice is a makeover of a very basic rice pilaf often found on North Indian tables. It is complex enough to distinguish itself from basic white rice, but still easy to prepare for everyday meals. and about 1½ cups of water. Add the peas. Quick Release for any residual pressure. Serve as an an accompaniment to any other dish. This tastes delicious, especially if you like cumin and is extremely easy to make. It is a good, easy side dish to make and feeds a family easily. I loved how easy it was to make this, although it did require a tiny bit of prep time outside of the Instant Pot® but that is okay. Here is another recipe I made called Saag Paneer/Tofu: Creamy Spinach with Paneer/Tofu. Like I said I am a vegetarian, which means I don't eat meat, although you could say I am more of a pescetarian. I eat seafood and sometimes chicken. The author notes that Saag Paneer is a soulful, homestyle dish, particularly favored on winter tables in India. There are many ways of making this dish and this particular recipe is something that she tasted in a small homey restaurant in the mountain regions of Uttarkhand. Her vegetarian daughter is especially fond of it. She won’t eat it with paneer, but she does like the vegan version made with tofu. Using frozen spinach for this recipe is a perfectly viable option, but it is important to squeeze out the excess water from the spinach before cooking. I made it with tofu because I couldn't find paneer, which is cheese from India. and tomatoes and cook until the spinach is wilted. Stir in the coconut cream. Press Cancel to turn off the Sauté mode. smooth—it is important to have some texture for this dish. cilantro, and serve with homemade or store bought flatbreads. There is a bit of prep work to this dish too. Which is okay, because as with any dish, there is always a bit of prep work. I like the way it turned out, as it tasted delicious. I love spinach and I also love tofu, which absorbs any of the spices that it takes on. Instead of grapeseed oil, which I could not find either, I used a bit of olive oil, which is good for cooking and tastes very good. The garam masala I had already and can be found at supermarkets with an international section. I had my boyfriend test both of these and he liked them. He is from a different region in India, and each region has their own cuisine. So he is not familiar with this spinach dish per se, but he has heard of it. He has had the rice dish before and likes it. He said the version from the pot came out very well and tasted great. I think this is a great cookbook and is perfect if you love Indian food and if you have an Instant Pot® at home sitting there that should be used because it is extremely easy to use. This is a great way of getting the best out of it. This book was well written and the recipes are easy to read, easy to cook and from the ones I tested, taste delicious. I would have taken pictures but I don't take very good food pictures and I believe in taking the very best photos possible. Otherwise I don't show them to you. 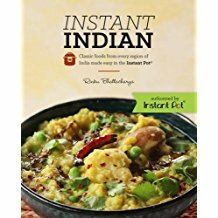 Instant Indian: Classic Foods from Every Region of India Made Easy in the Instant Pot® by Rinku Bhattacharya retails for $19.95 and can be purchased online at https://amzn.to/2x8DpJ3. Follow Rinku Bhattacharya on Facebook: https://www.facebook.com/spicechronicles, Follow Rinku Bhattacharya on Twitter: @Wchestermasala and Follow Rinku Bharracharya on Instagram: https://www.instagram.com/spice_chronicles. Take my advice and order a copy today.